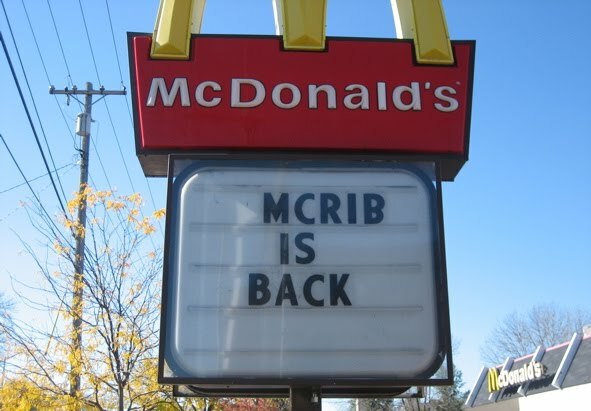 Hungry Jerks - Food Recipes and Restaurant Reviews: McDonalds McRib Is Back! I am not a fan of McDonalds. At all. In fact it is the last fast food place I ever even think about going to. And I never do. Ever. In fact I actually do whatever I can to steer clear of fast food. I have found as I get older, the more fast food I ate, the worse I felt afterwards. So I usually try to either make food at home, or get something fresh like a sub or a salad. But I have a weakness. And it is the McRib. Now the McRib is pretty much the greatest fast food item of all time. But is it REALLY? Honestly, I think the reason why the McRib is so beloved by people, may actually be because of how elusive and rare it is to get one. When the McRib comes to McDonalds, it is always a huge event. So it seems to be the best thing in the world at the time. But if the McRib was always available, and always there to eat at every McDonalds, would it still be as good? It's really hard to say, but I would have to say no. I don't think the McRib would be as good or as awesome if it was a regular menu item. It would just be one more thing people complain about, like the McGriddle. Blagh. But, the McRib is not a regular menu item. Instead, it is a wonderful thing that comes along every now and then, to brighten our day, and widen our guts. Now if you will excuse me, I have a McDonalds to go to. 1 McRib and 1 large Hi-C, here I come. I have to say, I think the McRib being treated as a special event is what keeps it awesome. I think this is indeed retirement tour number 7 or so. I think if it stuck around, we would question what the hell we are eating. A piece of meat shaped like ribs, but no bone, hmm. See, too much thinking....just need to enjoy it once a year while it lasts and not ask questions.